Sarah Jones' 12 Week Transformation Journey! Weeks 1-2. During the next 12 weeks, Kris Gethin will be training and guiding fellow Bodybuilding.com employee Sarah Jones in a 12 Week Transformation Journey! Follow these exact guidelines and you can experience your own personal transformation success. My name is Kris Gethin and I am the Editor in Chief of Bodybuilding.com. Throughout the following 12 weeks, I will be training and guiding fellow Bodybuilding.com employee Sarah Jones, so you can also follow these exact guidelines to experience your own personal transformation success. I have successfully transformed the lives of hundreds of clients in the past and now I am going to show you how to do it - FOR FREE. You can&apos;t afford a great trainer, you don&apos;t know what you should eat, and you have no idea what to do - NO MORE EXCUSES. Over the coming weeks, join me as I transform Sarah&apos;s health, fitness and appearance dreams to reality, so you can do the same. BodyBlog: "My Favorite Time of the Day..."
Download video here (288 MB). Click The Play Button Above To Start The Video. Please be sure to warm up for 5-10 minutes cardiovascular prior to weight training. Also, warm up for several sets prior to your working sets. Failure should be reached at the end of every working set. To complete another full repetition should be near impossible due to muscle fatigue. Click Here For A Printable Log Of Day Three. * Conduct 20 minutes of cardio following breakfast every day. This can range from, power walking, cycling, stair stepper, or cross trainer. 4 - 6 liters of water per day. A good multivitamin should be taken as directed. It&apos;s next to impossible to fulfill all of your nutrition needs with whole foods alone. 5 grams of Glutamine should be taken upon waking and retiring. This should also be taken before and after workout to assist muscle recovery efficiency and to help maintain a healthy immune system. A high quality whey protein isolate should be taken immediately following workout to further aid recovery and fill the "window of opportunity" of muscle growth. MRP&apos;s can act as a meal for those of you that have trouble eating at 5 or more sittings per day but I do not recommend consuming two of these supplements in a row. This is a predigested food and not as filling as a regular meal. Too many of these in succession can lead to hunger and possible craving. Try to break it up if possible so you are having a shake in between solid meals. As well as being a healthy option, they taste great. A fat burner such as Lipo 6 can assist with regulating a normal metabolism, which can slow down when on a calorie restricted diet. A thermogenic such as this can increase the temperature of the body in order utilize more calories. A fat burner can be a great aid taken prior to the workout and prior to cardiovascular exercise due to its ability to provide a much needed energy spike. A quality creatine product should be taken twice a day; 5 grams once in the morning and again after working out. One scoop of Vitargo CGL is also a great product to take post-workout. Take a before picture to remind yourself of what you do NOT want to look like in the New Year. This should feed you the motivation to work towards the changes required to make that "before" picture extremely vast from your "after" picture. You might not want to show anyone that before picture now, but believe me, you will want to show them when you compare it to your after picture. It may sound strange at this point in time, but you will become proud of that picture because every time you look at it, you will see and understand all too well, what you went through to change your appearance and your lifestyle to go from point A to point B. Write down your goals in present tense to help you experience the feeling of accomplishing those goals. Imagine how it will feel to hear positive comments off family and friends. Start looking in shops that carry the clothes that you would like to be able to wear in 12 short weeks. 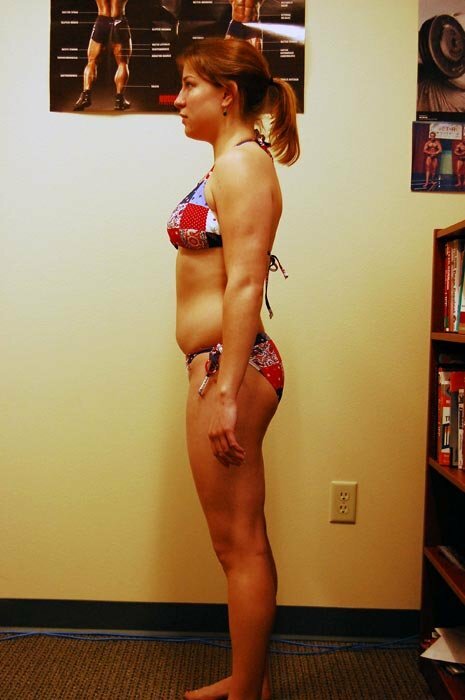 Read More About Sarah&apos;s Transformation In Her BodyBlog Here!